This was a "save". 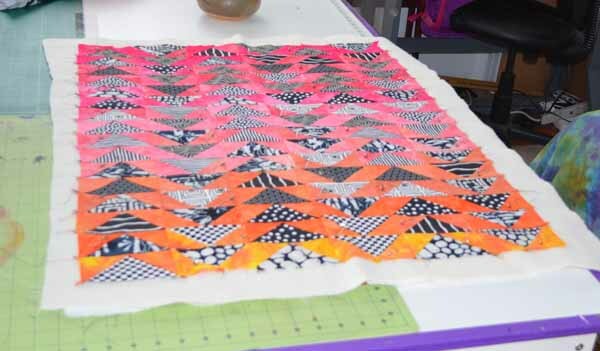 I made Magpie Sunrise as a sample of how to make quick "tricks and cheats" flying geese. It just took less than a day to do the 24 X 32 piece. 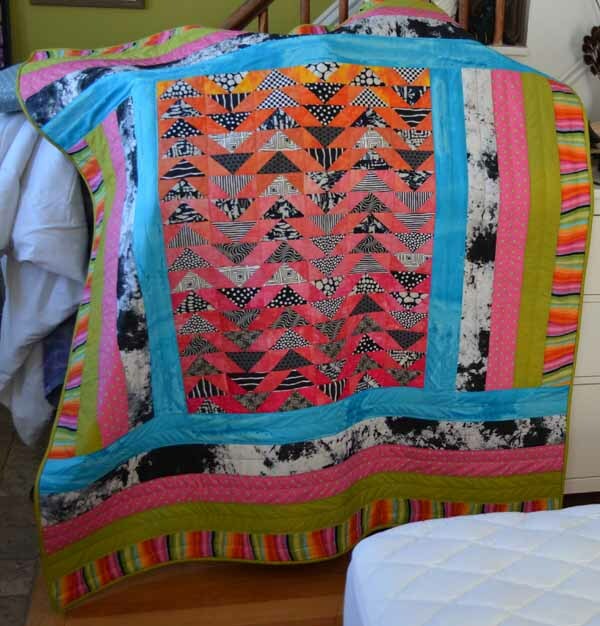 It sat on a shelf in one of my baskets for well over a year and when I saw it one day I thought about using it to make a lap quilt to donate to PuppyLoveME. I told Laurie at Puppy Love that I would take "James" as a foster - at least get him up here to Maine where he had a better chance of being adopted. I knew this was a great way of giving myself a deadline. 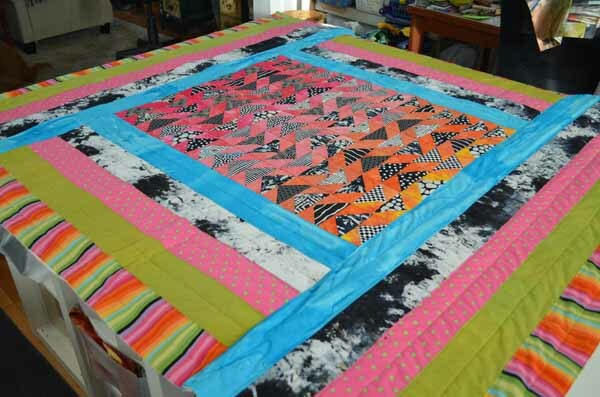 First I had to sandwich up the center panel and quilt it. 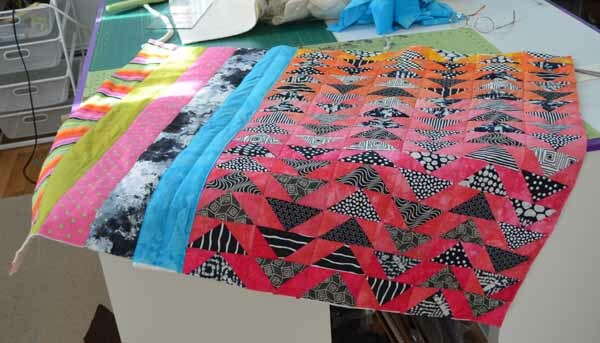 I am using the quilt-as-you-go method of assembly. For more info on QAYG, check the tutorials above. I showed the fabric choices on yesterdays post. 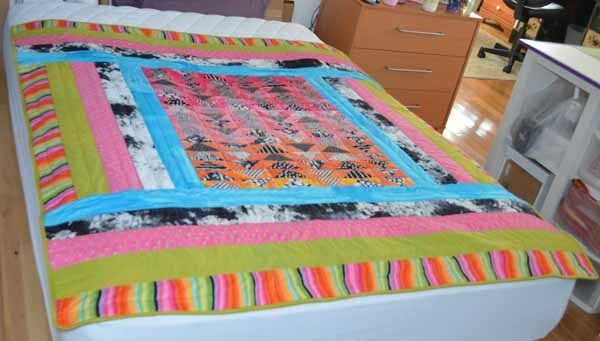 I picked the turquoise because it reminded me of the sky (flying Magpies), the black and white fabric which I made as a link to the Magpies, pulling them out into the border. The pink also pulled the pink from the center out into the border and the green which I dyed actually matched the green dots in the pink. The last stripe was that 60's psychedelic curvy strip which had all the colors in it. 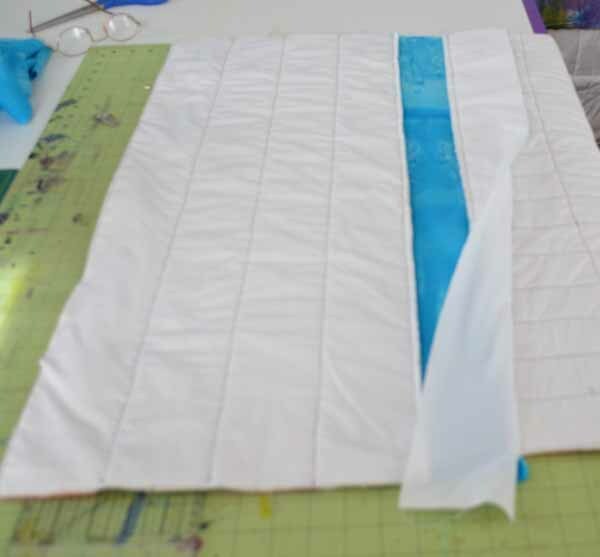 I am attaching the first side piece to the body with the turquoise fabric, then I quilted it. Now the bottom section laid out on the bed above the center and two sides. 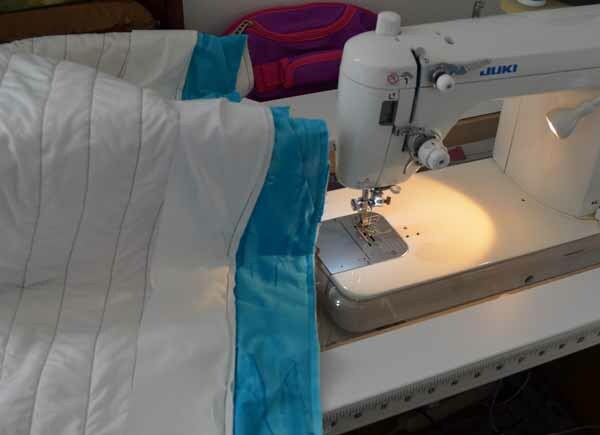 Attaching the turquoise strip on one side and a white backing strip on the other. Backing piece ready to go. 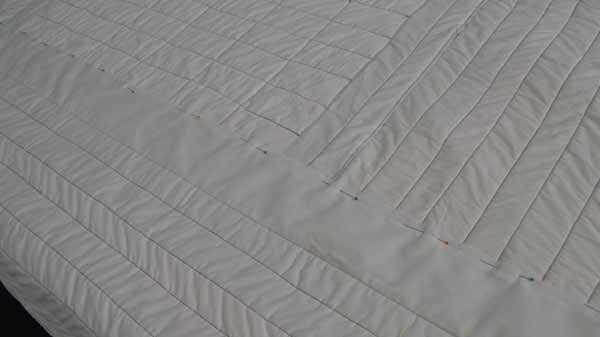 Pinning the backing strip in place. All pieces joined waiting to apply binding. I made the binding from the green fabric that is in a stripe. No one way home to hold it up for the camera so I tried to improvise. Within an hour I was in my car and on my way to pick up James. I hope it sells well for the dogs sake. It's all about the dogs!! I like how you did, the colors are lovely. Thanks Carmina and I'm so glad your cold is better. Spring WILL come!! 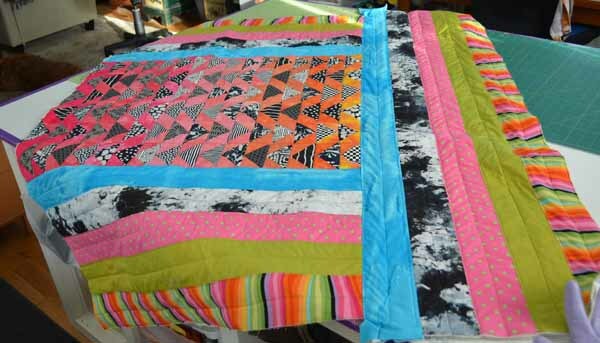 also the tutorial on "Quilt As You Go" QAYG is in the header above. VERY easy to do. You are such a kind person! Bless you, for all you do for others! We love the little guy!!! I am starting a new quilt today because his expenses to PuppyLove were over $800. and we were only charged $400.